Succulent ice plant - with bright fuschia flowers adorning the short, finger-like foliage - is the perfect groundcover in sunny areas where irrigation is a problem. 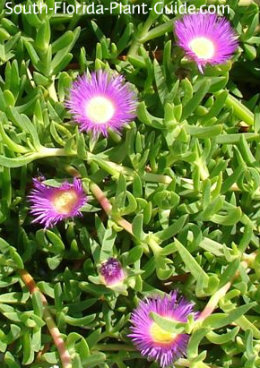 There seems to be some confusion over the this plant's common name, which is used for other succulents mainly grown on the West Coast of the U.S.
Another common name for carpobrotus chilensis is "Sea Fig" though "ice plant" is the name usually provided for this plant by South Florida nurseries. These drought tolerant groundcovers are low growing and easy care. The only thing they require is good amount of sunlight and watering during dry spells. They work well surrounding other plants that like it on the dry side and will fill in nicely around landscape boulders. Another use is along the roadside where nothing else wants to grow...and irrigation isn't available. It may take some time for the plants to completely fill an area but once they do they'll form a beautiful mat of greenery highlighted by the pretty purple flowers with yellow centers. Another groundcover called hardy ice plant (Delosperma cooperi) looks a lot like moss rose portulaca and is cold hardy. These plants do best in a full to part sun location. They prefer the warmth of Zone 10. Hugging the ground, the plant rarely grows more than about 6 inches tall. Its growth rate is moderate. A well-drained location is an absolute must. Add composted cow manure to the hole when you plant. No trimming is necessary other than to edge the area as needed to keep it looking neat. Water on a regular basis but you must let the area dry out between waterings. Too wet soil is this plant's worst enemy. Fertilize twice a year - in spring and late summer - with a good quality controlled release fertilizer. Place plants about 2 feet apart. Come in from walks and drives at least 2 feet. This plant will grow in a container but it does best in the ground. COMPANION PLANT SUGGESTIONS: Use with other drought tolerant things like dwarf clusia, crown of thorns, desert rose, bougainvillea tree, Green Island ficus and muhly grass. Attention South Florida Business Owners! Sign up here to be listed in our FREE Directories. ...with our Landscape in a Box! We've put together plant groupings to help you visualize how various plants look together. 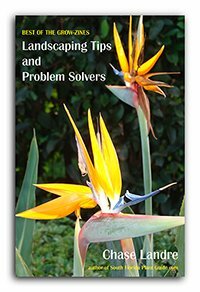 Get a finished look to your new landscaping - Here's how! 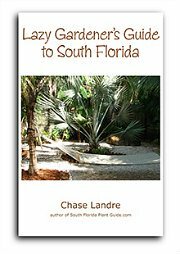 Lazy Gardener's Guide to South Florida - a unique ebook about low-maintenance plants and landscaping! 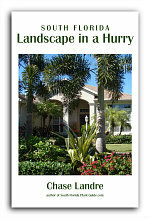 Ebooks on South Florida gardening! Here's a handy paperback guide just for you!